You never knew Henrikh Mkhitaryan's mum is very beautiful right? 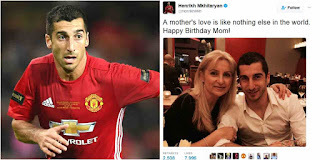 The Manchester United player who shared a beautiful photo of his mum whose birthday is today, wrote; "A mother's love is like nothing else in the world. Happy Birthday Mom!" enough to be the Armenian international's mum.